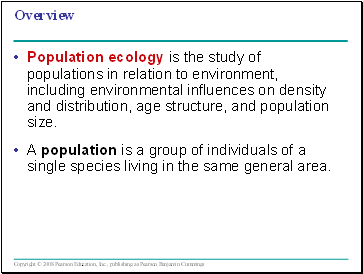 Population ecology is the study of populations in relation to environment, including environmental influences on density and distribution, age structure, and population size. A population is a group of individuals of a single species living in the same general area. 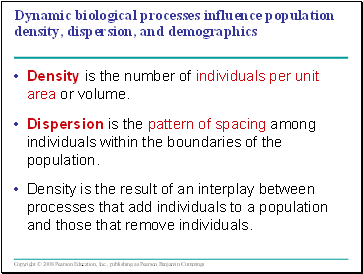 Density is the number of individuals per unit area or volume. 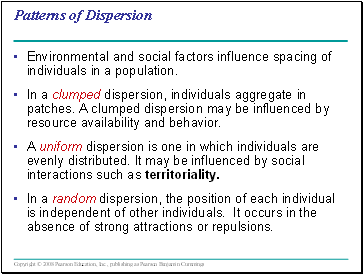 Dispersion is the pattern of spacing among individuals within the boundaries of the population. Density is the result of an interplay between processes that add individuals to a population and those that remove individuals. Immigration is the influx of new individuals from other areas. 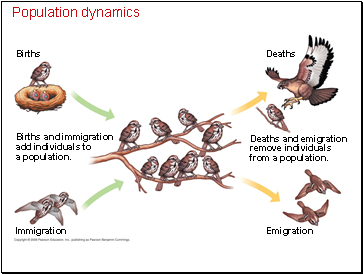 Emigration is the movement of individuals out of a population. In most cases, it is impractical or impossible to count all individuals in a population. Sampling techniques can be used to estimate densities and total population sizes. 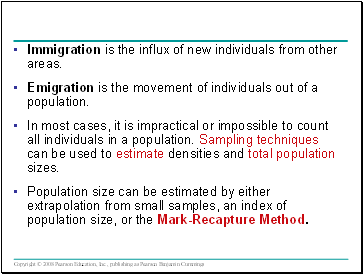 Population size can be estimated by either extrapolation from small samples, an index of population size, or the Mark-Recapture Method. Environmental and social factors influence spacing of individuals in a population. In a clumped dispersion, individuals aggregate in patches. A clumped dispersion may be influenced by resource availability and behavior. 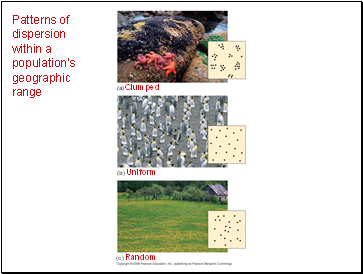 A uniform dispersion is one in which individuals are evenly distributed. It may be influenced by social interactions such as territoriality. In a random dispersion, the position of each individual is independent of other individuals. It occurs in the absence of strong attractions or repulsions. 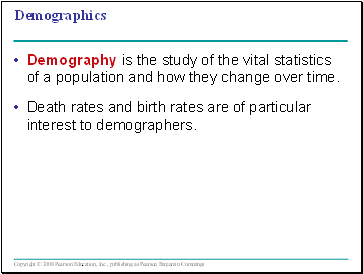 Demography is the study of the vital statistics of a population and how they change over time. 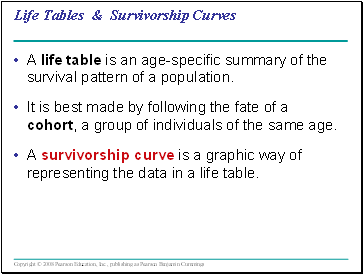 Death rates and birth rates are of particular interest to demographers.